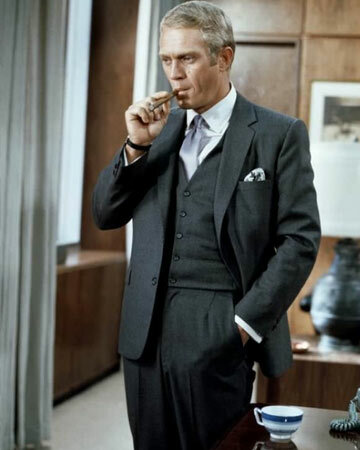 He has always topped men’s style lists, but who was Steve McQueen? An American actor, he was popular in the 1960s and 1970s with films like The Cincinnati Kid, The Thomas Crown Affair and The Magnificent Seven. At one point he was the highest-paid movie star in the world and tales of his defiance with producers and directors did nothing to sway his reputation or popularity. This bloke next door with a cheeky grin and sandy blonde hair was always a hit in the fashion stakes and with the ladies. His wardrobe both on and off the screen has influenced male actors even today. So what’s all the fuss about? 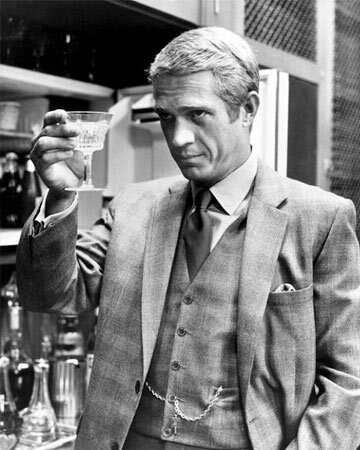 We take a gander at some of Steve McQueen’s most iconic looks and show you how they can be done today. A simple look for a casual weekend, this outfit is as contemporary as if the photo was taken yesterday. A plain navy windbreaker with tartan lining, a ribbed wool knit and a pair of chinos suggest smart casual for the conservative crowd. A pair of smart brown sunglasses and the look is ready for the golf course. Cocktails anyone? A fine check adorns this grey flannel three-piece suit. Generously cut in the style of the period, it has some interesting details. The square bottomed waistcoat stands out from the traditional style, the collar is cut away to points and the fob chain gives an elegant touch. Very debonair. Boardroom cool; this suit has similar proportions to the previous, only this time in charcoal wool. The sleeve length is perfect to display his French cuffs and the fabric drapes well on his form. An interesting detail is the slight pleat at the pocket, which gives the trousers a better fit. Accessorise with a cigar. So chic, so Ferragaamo current season. A sun-kissed McQueen rivals his tan speed bomber jacket, replete with cool accessories like TAG Heuer Monco watch (they named one after him!) and a silver bracelet. The ribbed sweater is back, this time in brown. A great look to replicate with chinos or jeans. Apparently tartan lining was big in the ‘70s. Another windbreaker, this time in beige and again with the chequered lining. The red tartan is a pop of colour against the natural background, worn with an open-neck white shirt and V-neck jumper. We can’t tell what’s in his hand, but it looks like he’s about to detonate something. Badass.